When it comes to renovations, homeowners spend more money on kitchen remodels than on any other project that improves the home. Before you dive into a renovation, think about how you want your cooking space to function, where is your storage and how is your prep and cleanup laid out? Planning is of utmost importance to make this hardworking room function the way you need it to. Base. Standard base cabinets are 24 inches deep and 34.5 inches tall. Depth may be increased up to 27 inches on some semi-custom and custom applications. For ease of use, base cabinetry rests atop a four-inch recessed riser called a toe kick. Wall. Upper cabinetry is generally 12 inches deep but can be increased to 18 inches on some semi-custom and custom applications. Tall. Tall cabinets are typically a minimum of 84 inches in height, serving as pantry space and broom storage. Cabinets are grouped into four grades based on quality of construction: ready-to-assemble (RTA), stock, semi-custom and custom. Decide up front on the amount of money to be invested in cabinetry and then browse cabinetry lines and options within your budget. Installation costs may be included but are often quoted separately. Look for sound construction, regardless of whether you are purchasing stock, semi-custom or custom cabinetry. Maintain an open mind—well built, inexpensive cabinetry can look spectacular and may be well suited for many applications. Ready-to-Assemble (RTA). Readily available and constructed with cost in mind, these cabinets are purchased boxed from chain home stores. Selection is narrow in style, size and material and they require assembly. If you are skilled with do-it-yourself home improvement projects, you can save a significant amount of money on RTA cabinetry. However, long-term durability often results in trouble over time. If you are considering purchasing RTA cabinetry, make sure you are well versed in constructing and installing cabinetry, which can be tricky, even for a skilled professional. Stock. Purchased pre-sized from their manufacturer, stock cabinets are a basic and economical option. Stock cabinets are mass-produced, available in fixed sizes and cannot be altered, making them less versatile for existing spaces. These cabinets are constructed on site from modular units. Stock cabinets are size-specific, measured in 3-inch increments. Stock cabinet materials range from particleboard covered with plastic laminates or melamine to solid wood, depending on the manufacturer. They offer a relatively limited range of accessories. While some stock materials only meet minimal standards and aren't generated from valued woods, thoughtfully purchased stock cabinets may offer attractive and affordable style without sacrificing quality. The price of installation for stock cabinetry is typically not included in their purchase price. Semi-Custom. With a broader selection in both style and material, semi-custom cabinetry generally marks the mid-range option in terms of price point. Semi-custom cabinetry allows some size adjustments and usually offers better quality cabinet construction. These are special order cabinets. They're standard in certain sizes but can be altered for increased depth, they offer some changes but not all. Semi-custom cabinetry boasts an extensive selection of styles, finishes, storage solutions and decorative enhancements, featuring a personalized look at a reasonable price point. Semi-custom cabinets consist of everything from stock cabinets fitted with custom doors to made-to-order cabinets selected from a manufacturer's catalogue of featured styles, materials and finishes. Custom. On the high-end, custom cabinetry is completely made-to-order and offers the most diversity in style, material, finishes and accessories. These cabinets are one-of-a-kind with tailored sizes and innovative design solutions, suiting even the most unique spaces. Narrow measurements with exact increments down to the 32nd of an inch offer precision rivaling English Imperial standards. While design options are limitless, these high-dollar cabinets can quickly exhaust a budget. With custom, you'll get exactly what you want with the superior hand-built construction of skilled artisan, it's designed much like furniture. You have the flexibility of any size, shape, depth, or finish and accessories that push limits. Possibilities are endless—there are absolutely no standards. The price of custom cabinetry often includes installation and delivery. Below is a link to a long list of kitchen cabinet styles currently in use, from Old World to modern, and everything in between. In smaller kitchens, the size and shape of the room will often dictate the layout. In larger rooms there are more options to consider. Typical kitchen layouts are galley, L-shaped, or U-shaped, and may include islands, breakfast bars, and dining areas. Once you have formulated some ideas about what design and style you are looking for, the next step is to speak to your Echelon Factory Direct Cabinet Dealer. Take accurate measurements of the room. Include existing alcoves, room height and width, and heights and widths of windows and window sills. Your supplier may be able to produce a computer-generated design to give you a good idea of what your kitchen will look like. 1. Ensure accuracy. You’ll need a tape measure, straight edge and graph paper. 2. Measure clockwise. Record the overall length of each wall, working to your right around the room. Label walls, windows and doors with numbers. 3. Get the width and height. Take horizontal measurements of walls at 36-inch height. Record vertical measurements floor to windowsill, from windowsill to top of window, from top of window to ceiling, then from floor to ceiling. 4. Find your center. Indicate the center-line of all permanent features in all measurements including wall oven, range, sinks, windows, doors, closets, ducts and outlets. 5. Include the trim. When measuring doors and windows, the casing is considered part of the door or window. Measure from one side to the other of the door or window trim, then measure from the outside of the trim to the middle of the window or door. How to install your beautiful new Kitchen! Before you start to install your kitchen cabinets, you should have removed the old kitchen, rerouted any utilities, and have the option to replace or finish the floor, if that is your plan! Why Kitchen Remodels become Kitchen Disasters! 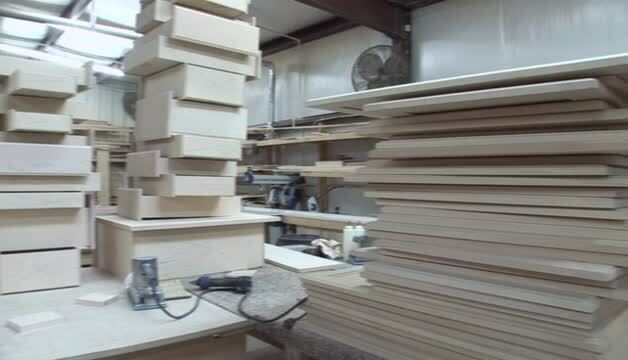 Cabinetry 101 – The Construction, How They Are Made! All Plywood, Particle Board, Laminates, MDF? Cabinetry 101 - Bells and Whistles!